Christopher Bell had been close to victory at I-30 Speedway before, only to come up one position short. The 19-year-old from Norman, Okla., changed that on Friday night by topping the fast and furious, non-stop 25-lap feature that put the wraps on the second night of qualifying at the track’s 27th annual COMP Cams Short Track Nationals presented by Hoosier Tires. Although he started from the pole in Brandon Berryman’s All Pro Auto Reconditioning No. 31b JR1 chassis, his 23rd overall victory of 2014 didn’t come without a race-long battle with fellow Sooner State shoe Matt Covington, who paced the initial 16 laps. Covington settled for runner-up honors in the T&L Foundry No. 95 Triple-X to secure a position in his second career STN finale and first since 2011, while West Memphis shoe A.G. Rains landed a berth in his seventh career STN main event with a career-best third-place STN preliminary finish aboard the ACME Racing No. 3. With Bell and Glenpool’s Covington earning the front row for the main event, Covington gunned into the lead at the outset. While Covington working the lower half of the track for the most part, Bell moved in on the topside and began pressuring the Devil’s Bowl Winter Nationals champion for the point after a handful of laps. Dicing through traffic, Bell slipped by Covington in turn two on the ninth round only to have Covington battle back in front through turns three and four to retain command. Bell kept the pressure on through traffic and finally made what proved to be the race-winning move coming off turn two on the 17th circuit. The race was far from over though, as Covington kept Bell within striking distance and closed back to within a pair of car-lengths as the white flag flew. 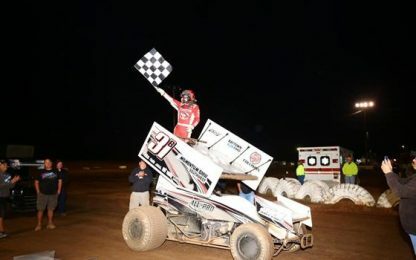 Bell was steady on the final round, moving to the low side of turns three and four to preserve his third ASCS national your victory of the season by less than two car lengths. With Covington settling for runner-up honors, Rains battled past 1997 STN champ Wayne Johnson for third just past the midway point and held the position to the end. Johnson was fourth with fellow Oklahoma City racer Joe Wood, Jr., rounding out the top five. Terry Gray, the seventh STN king in 1997, was sixth with Washington native Gary Taylor racing from 14th to seventh. Liberal, KS, native Tony Bruce, Jr., a back-to-back STN winner in 2008 and 2009, rebounded from heat race issues to advance from 12th to eighth with Tulsa-area racer Blake Hahn and Memphis-area shoe Jerod Roller completing the top ten. Johnny Herrera and Styres topped the 12-lap “B” Mains. The final lap of the night’s first “B” Main got ugly when North Carolina’s Eric Riggins, Jr., drove through Harli White in the final pair of corners in the battle for the final transfer position. Both drivers escaped injury after flipping wildly with Dale Wester the beneficiary by inheriting the position.